The major deficiency symptoms of Folic Acid (Vitamin B9) is megaloblastic anemia, depression, irritability, tiredness, loss of appetite etc. If it is deficient in pregnant women, it can cause neural tube defects in babies. 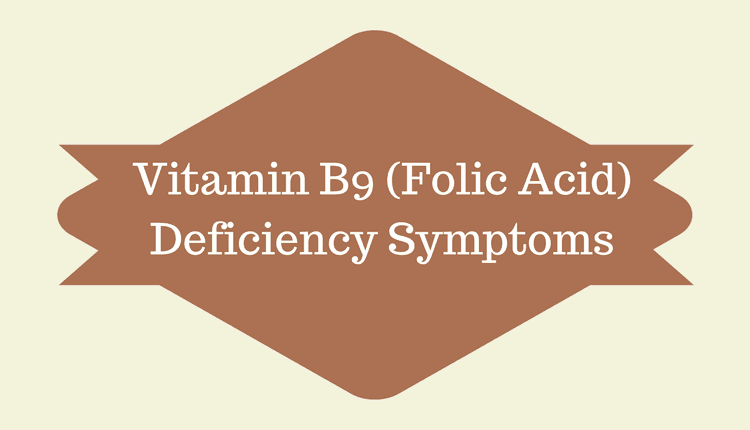 Folic acid or vitamin B9 is a water-soluble vitamin that supports the immune system, protects the heart, enhances proper growth and development, uplifts mood and improves memory and thought process. Insufficiency of such an important vitamin can cause serious problems in the body. Having low levels of folic acid in the blood can cause folate-deficiency anemia. Folic acid, a B-complex vitamin is required by the body for the production of red blood cells. These red blood cells carry oxygen to the various organs of the body. Research has found that low level of folic acid in the blood increases the risk of depression. Besides this, folic acid deficiency also reduces the effectiveness of anti-depressant drugs. Correcting folic acid level may help in the treatment of depression. It was observed that individuals treated with folic acid exhibited an improvement in the mood than those who did not receive such a treatment. Insufficiency of folic acid increases the accumulation of beta-amyloid peptides in the brain. These peptides form plaques in the brain, which destroy the healthy brain cells and lead to the loss of memory thus, causing Alzheimer’s disease. High level of homocysteine causes hardening of the arteries and the formation of blood clots. This increases the overall risk of heart diseases and stroke. Studies have found that folic acid is effective in lowering homocysteine level in the blood and thus, it protects against heart diseases. Poor maternal folate status is associated with an increased risk of neural tube defects, birth defects of the spine and the brain. Women who get sufficient folic acid before and during early pregnancy decrease the risk of neural tube defects in their baby.